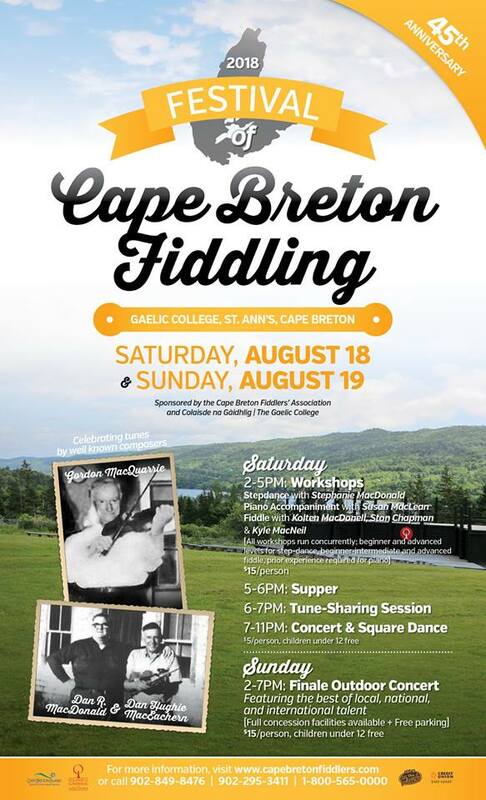 Coming up this weekend is the Festival of Cape Breton Fiddling on August 18 & 19 at Gaelic College, St. Ann’s. Saturday includes workshops, tuning, evening concert & square dance. Sunday is the Grand Finale Concert. Guest fiddlers from Glengarry, Ontario and Queen’s County Fiddlers from PEI. Everyone welcome. Friday, Aug. 3 – The Narrows – Irish style group from Halifax – Irish pipes, fiddle etc. Tuesday 7 – Joe MacMaster and Mac Morin – Cape Breton fiddle, pipes and piano. Friday, Aug. 10 – Kimberly Fraser and Brenda Stubbert – Cape Breton fiddles and piano. Friday, Aug. 17 – David Greenberg and Doug MacPhee – Cape Breton fiddle and piano. Tuesday, Aug. 21 – Stewart and Boyd MacNeill – Two members of the Barra MacNeils – fiddle, piano, flute, guitar, mando cello, tin whistle and vocals. Friday, Aug. 24 – Dara Smith and Susan MacLean Cape Breton fiddle and piano. Tuesday, Aug. 28 – Lucy MacNeil and Rob Durando – Fiddles, guitar, harp and songs. Friday, August 31 – Rocky Shore – Local group of fiddles, guitars, vocals and more. Friday, September 7 – Buddy MacDonald & Rachel Davis – Cape Breton fiddle, guitar and vocals. Friday, September 14 – Dwayne Coté and Doug MacPhee Cape Breton fiddle and piano.